Install DeVeDe and Brasero, and use them to make DVD player compatible DVDs. This will work on just about every Linux distribution. A working Linux install with root privileges and a DVD burner. 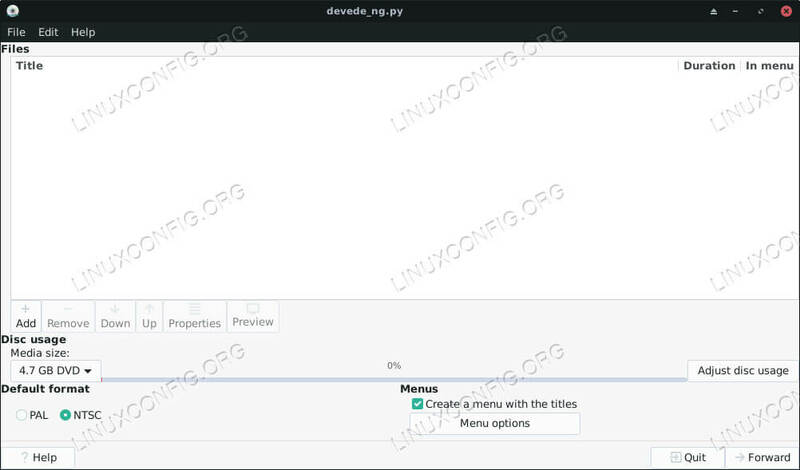 On Fedora, you need to enable the RPMFusion repostiory in order to install DeVeDe. If you haven't already done so, add it to your system. Then, you can install it. When DeVeDe first starts up, it'll ask you which type of project you want to create. In this instance, the first option, "Video DVD," is the right choice. 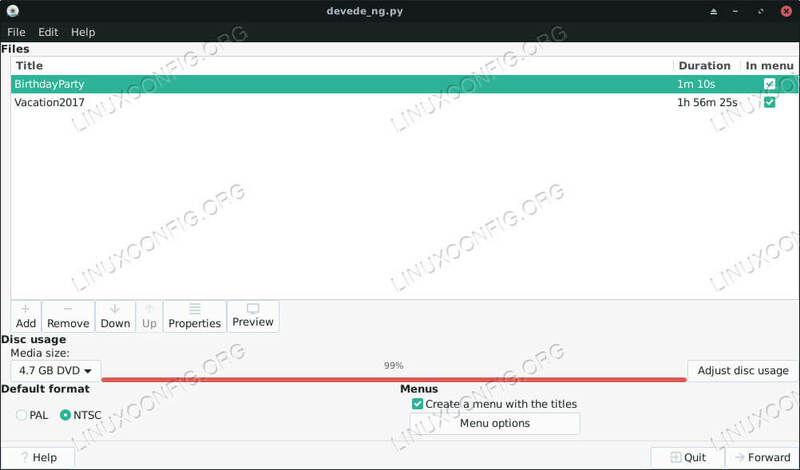 DeVeDe will open up a new window for your project. The top half of the window is dominated by a huge white field where you can add video files to your project. Below it are controls that allow you to control format and give you an idea as to how large the resulting image will be. Notice the "Media size" dropdown to the left. That serves as the control for the adjacent graph. Use it to determin whether or not you have enough disk space on your media for the image you're going to create. Also, note the "format" option. Be sure to set it to match your region. If not, it will not play in a standard DVD player. Adding your videos to DeVeDe is easy. Click on the "+" icon below the white field at the top of the window. It will open up a file browser that will let you browse to the files that you want to import. As you import files, keep an eye on the bar below. It will begin filling up with each file, demonstrating the amount of space used on your disk. Once you have your videos added, you can shift around their order on the DVD and in the menu with the "Up" and "Down" buttons. Highlight the video that you want to move, and click the buttons to move it. You're not stuck with the generic menu provided by DeVeDe. Click the "Menu Options" button to edit your DVD menu. The window will change to reflect the menu options, and there are quite a few of them. At the top, you can add a title to your DVD. It'll appear at the top of your menu. The preview to the right of the screen will reflect any changes that you make, which is nice because you can change the text and styling of your title and the menu as a whole to match your project. Below the title controls, you can add a background image for your DVD and add some background music for the menu screen, if you wish. Next, you can control the styling of the menu itself. Change the menu position, font, color, and text effects. Again, this is all reflected in the preview, so feel free to play around. The last option allows you to choose the default behavior of your menu. Leaving it to display the menu is probably a good idea, unless you have something specific in mind. When everything is to your liking, click on the "Forward" button to begin creating your DVD image. Depending on the size of your project, the process may take a while. It also creates a copy of the original files, so be sure you have enough space in the destination location to support the result. A new window will pop open asking you to name your project and which directory you want the output in. Select both and press "Ok." DeVeDe will begin creating your image. Now that you have your DVD image, it's time to burn it to a disk. If you haven't already done so, insert your blank DVD. Then, open up Brasero. On the left side of the screen, select "Burn Image." A new small window opens up. Click the top button to select your image. Browse into the folder for your DeVeDe project. Inside, you'll find an .iso file. Select it. Select the blank DVD from your disk drive in the bottom dropdown. When you have both, click "Create Image." Brasero will begin buring the image to your blank DVD. Depending on your drive, this may take a while. When Brasero is finished, it'll eject the disk. You now have a playable DVD complete with a custom interactive menu. It will be playable in your computer and any DVD player that supports the region format that you selected. This process is a great way to burn home videos and share them in a way that's compatible with just about every device.